Between the ladders, bikes, and golf clubs, there’s usually not much room left in the garage for actual cars. A few smart space tricks are all you need to help you regain some extra square-footage. Get organized (and find the weed killer when you need it) with these ingenious storage ideas. 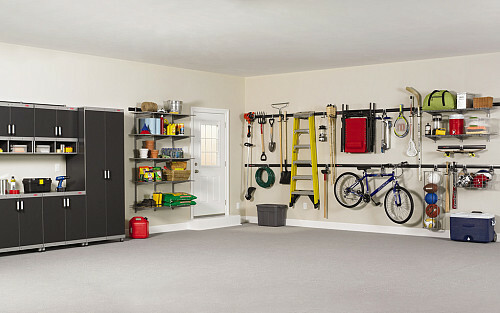 The easiest way to gain extra space is with a storage system. Try lockers, a rolling workbench, and plastic bins. DIYing doesn’t seem so bad when all of the essentials have a dedicated place. This steel pegboard keeps brushes, rollers, and tape close at hand for tackling that paint project. Not looking to drill holes in the wall? This free-standing storage unit keeps shovels, brooms, and rakes upright and out of the way. Sure, you may already have shelves, but wrapping a row of wire racks around a corner maximizes that tricky square footage. Add a big basket for runaway basketballs. No floor space? No problem. Hang storage bins overhead and never trip over your stuff again. © 2018 CENTURY 21 Arizona Foothills. All rights reserved. An Equal Opportunity Company. CENTURY 21® is a registered trademark owned by Century 21 Real Estate LLC. Each franchise is independently owned and operated. Equal Housing Opportunity.